This is the first in a series of reviews that I will be doing each month on websites promoting property rights. There are lots of them out there and in previous editions of our OLA News; we have referenced some of them. 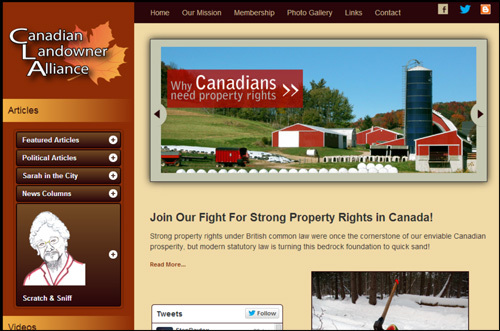 Today’s website is a relative new kid on the block: the Canadian Landowner Alliance. It makes a very good first impression – the design is simple and engaging and invites the visitor to explore various articles and opinions on global warming, property rights issues, and the invasion of private property by solar farms, among others. There is a good use of attention-getting photos on the “Home” page that you can click on to go to a related story. It’s easy to find your way around this site. Its well-organized and not too busy. The central theme, as stated by “Our Mission”, is advocacy for recognition of property rights at the provincial level, and enshrining property rights in the Charter of Rights and Freedoms. Whether you agree with adding property rights to the Charter or not, the discussion is an important one as illustrated in the article Why Canadians Need Property Rights. Visitors are invited to “Subscribe to our Membership” under the “Membership” tab. Presumably this puts one on a list to receive information by email. There are a number of useful links under the Links tab and also under the “Our Favourites” section in the side bar. The site is also well-connected to social media. Content refreshes often on the “Home” page courtesy of Twitter and an RSS feed. It also has a Facebook page.